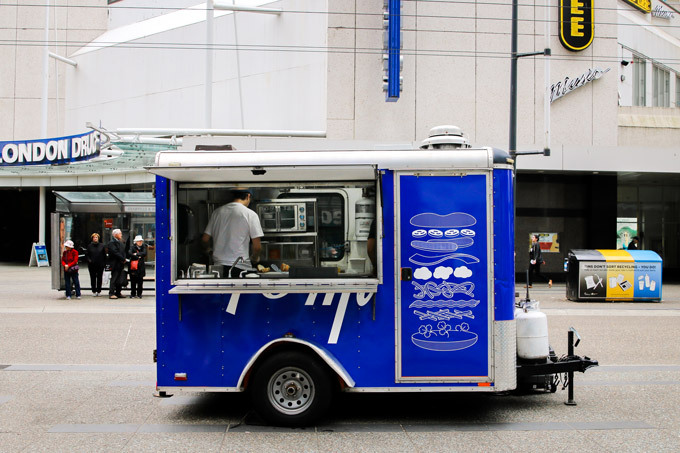 There’s a new food cart in town! 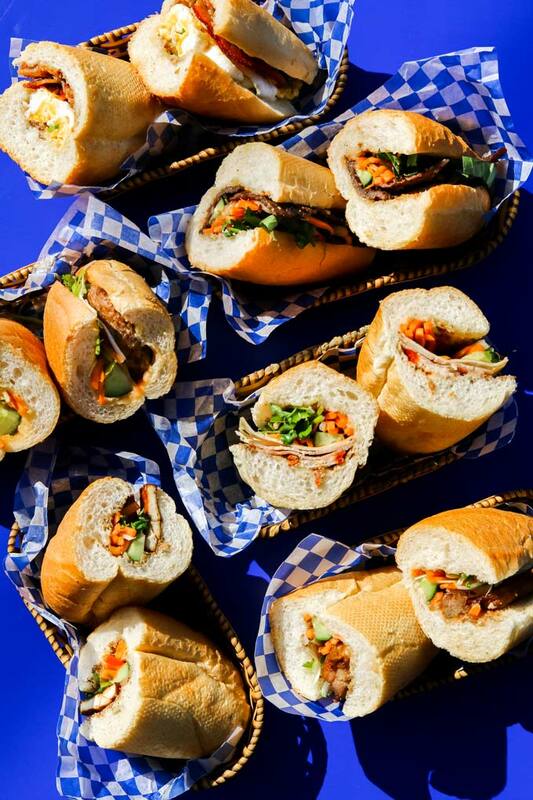 NaMì, offering a variety of grab-and-go Vietnamese fare, will be parked at 700 Granville Street (corner of West Georgia and Granville) in Downtown Vancouver beginning Tuesday, April 23. 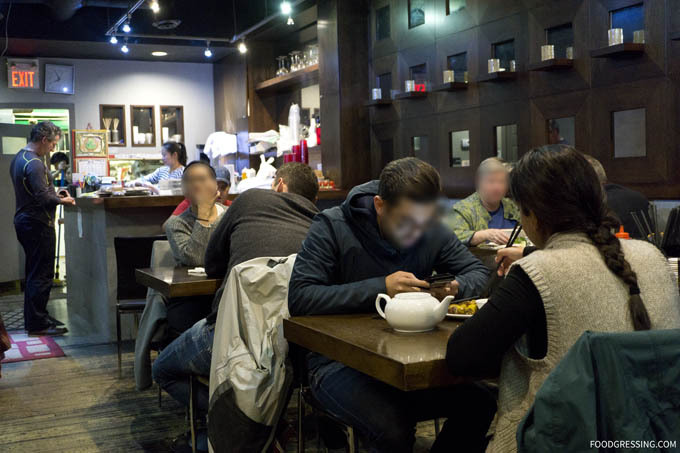 NaMì will be open seven days a week from 10 a.m. to 3 p.m.
NaMì is the brainchild of foodie, entrepreneur and recent UBC graduate Kevin Thach — who grew up learning the ins and outs of the restaurant industry at his parents’ award-winning Phở Thai Hoa 1Vietnamese restaurant at 1625 Kingsway. 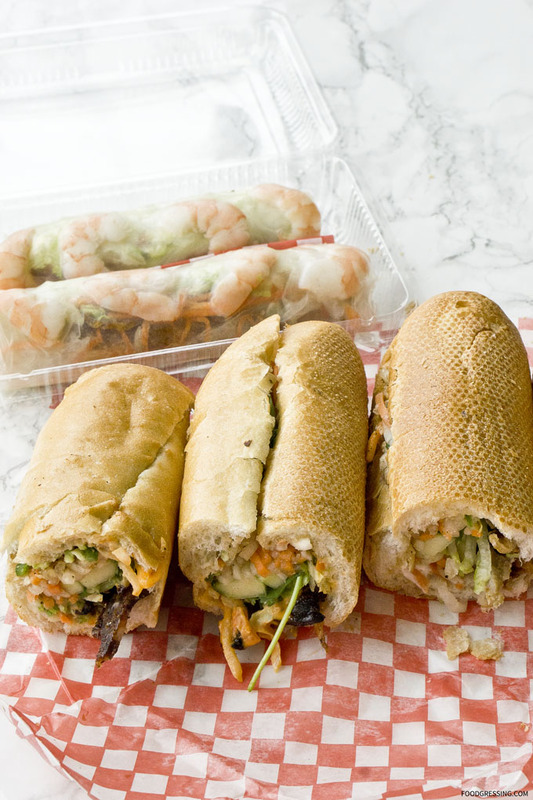 The NaMì bánh mì menu features a variety of fresh baguette sandwiches (in half- and full-size). These include Breakfast (scrambled eggs, crisp cured pork belly, paté, lemongrass and chili aioli, soy sauce, cucumber, pickled daikon and carrot, chopped chives), ‘Xiu Mai’ meatball (Vietnamese style meatballs, tomato and chili sauce, chopped cilantro), and Grilled Lemongrass Chicken (sous vide and grilled lemongrass chicken, lemongrass and chili aioli, soy sauce, cucumber, pickled daikon and carrot, spring onions), with add-ons such as fried egg, extra meat, paté, and carrots, daikon or cucumber also available. 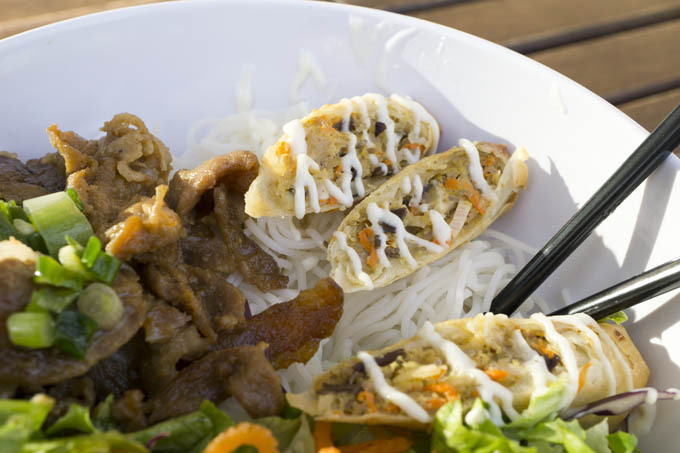 NaMì also offers a variety of sides such as deep-fried spring rolls (pork, shrimp, carrots, taro, mung bean vermicelli, mushroom) and salad rolls (shrimp/lemongrass tofu, lettuce, bean sprouts, carrots, vermicelli, cucumbers, peanut dip), as well as iced Vietnamese coffee made with condensed milk or sweetened condensed coconut milk. 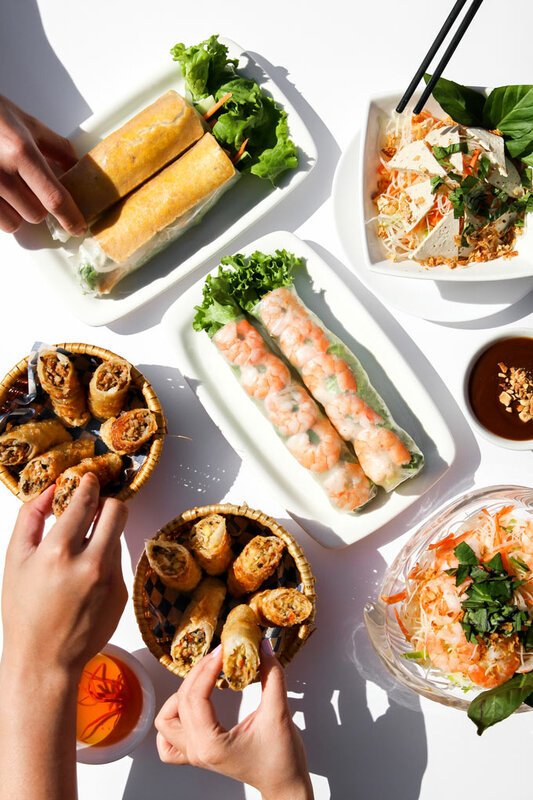 Monthly rotating features and vegan-friendly fare such as a lemongrass tofu bánh mì and papaya salad will also be available. 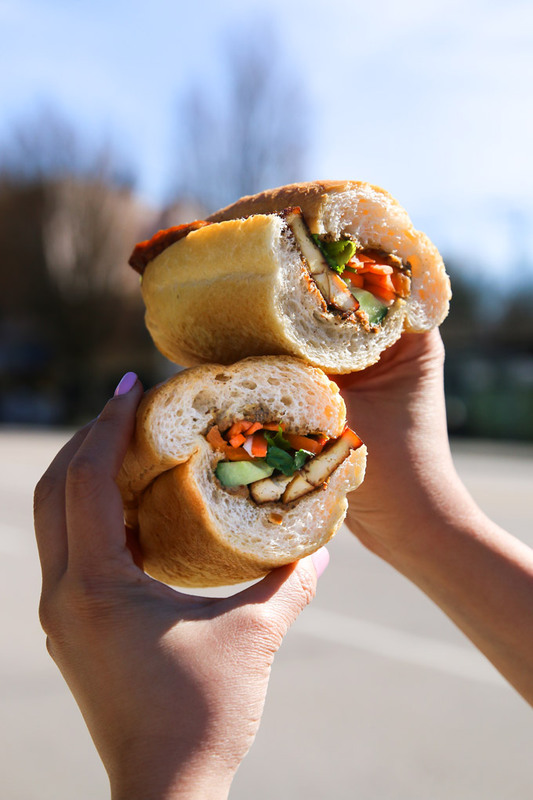 To celebrate its launch, the first 50 customers on April 23 will receive a free bánh mì. 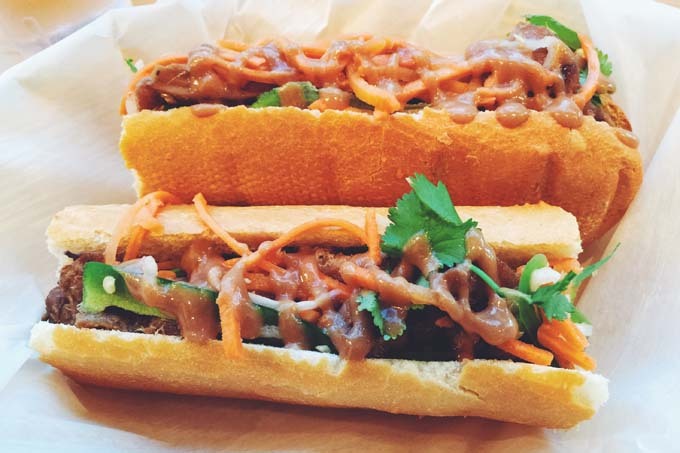 The cart will also be serving up a special $5 bánh mì throughout the first week of service, April 23 to 28. For more information, go to namivietnamese.com, become a fan of /namivietnamese on Facebook and follow @namivietnamese on Instagram and Twitter. 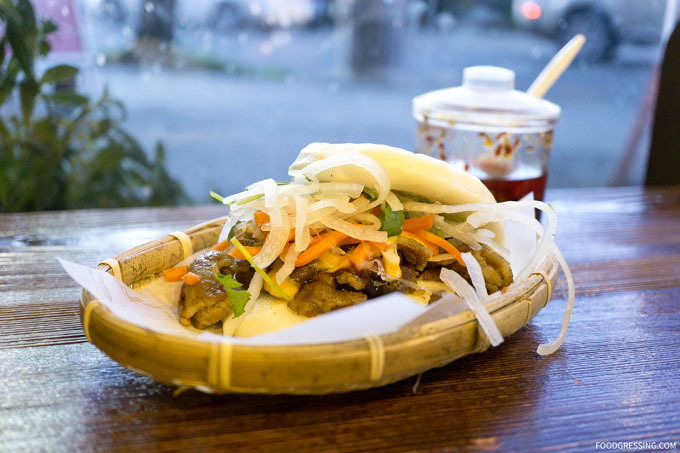 Cafe Phin is a small, Vietnamese restaurant on Denman serving casual Vietnamese eats like banh mi and pho. In the West End, I have frequented Pho Central, Pho Goodness and Viet Sub so I wanted to try something new. I decided to order foodora delivery from Cafe Phin to see how their food compared to the other popular Vietnamese eateries in the West End. My foodora order consisted of a Five Spice Pork Belly Banh Mi ($6.49), Prawn Salad Roll ($6.49) and Lemongrass Chicken Banh Mi ($6.49). Even after accounting for delivery time, I thought the baguette for the sandwiches weren’t particularly crispy on the outside. Both banh mi weren’t all that flavourful with the Lemongrass chicken one being rather bland. The amount of meat in the sandwiches was less than expected and had mostly veggies. The Prawn Salad Roll was perhaps the best of the order. It was filled with lettuce, cucumber, cilantro, noodles and pickled veggies. I thought the proportion of prawns to everything things was reasonable. The rice paper wrapper was nicely delicate and chewy. With my referral link, you can receive $10 off your first foodora order with a minimum order of $20. Using your mobile device, click here to receive the deal: https://bnc.lt/YR5e/QxdZHcjmXL. New customers only. Baoguette Vietnamese Bistro on Denman is one of my favourite place for Vietnamese food in the West End. Its location is in English Bay at the corner of Davie and Denman. 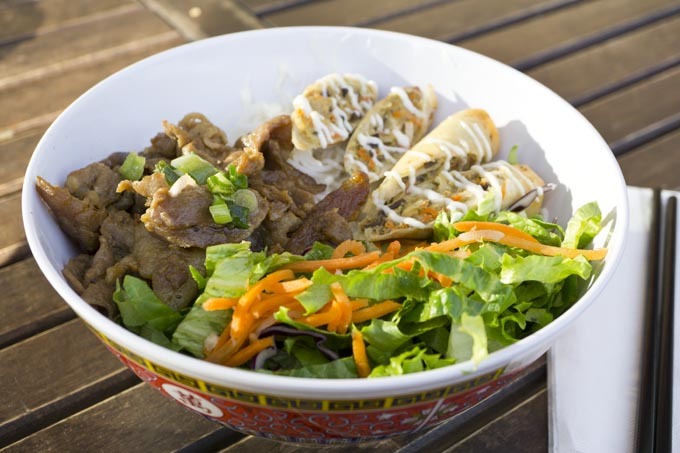 Their menu features Vietnamese classics like banh mi, pho, vermicelli bowls and rice dishes. Being in a prime area, their prices appear to be slightly (maybe 10%-15%) above other Vietnamese places in the West End. 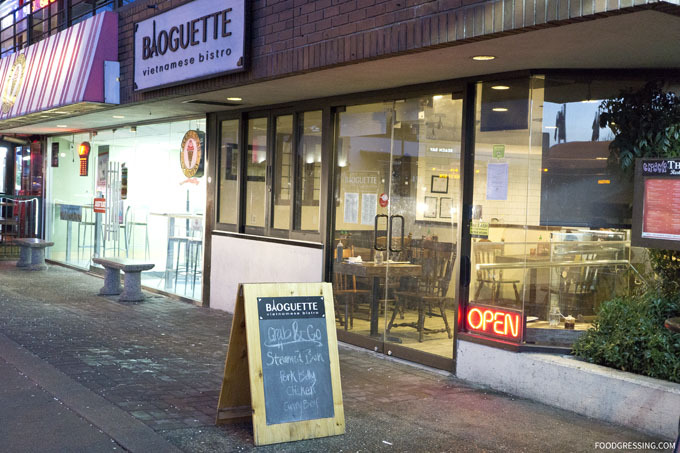 However, Baoguette’s items are generally under $12 whereas similar Vietnamese places in the West End like Pho Central and Viet Sub are mostly $10 and under. The inside of the restaurant is divided into two levels. The street level is the main dining area while the bottom level is mainly counter seating. If you sit by the window, you have views of the water. 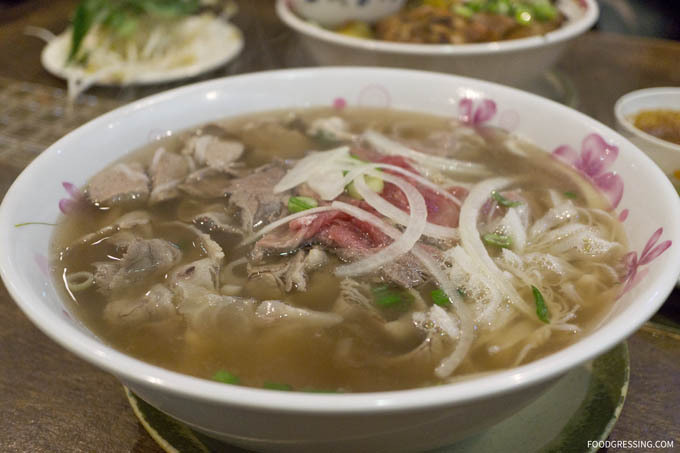 The pho tai nam had a very light, flavourful beef broth with tender slices of rare beef and brisket. The banh mi I tried were pretty good though the baguette could be a little crispier on the outside. The grilled lemongrass pork banh mi was solid: the filling was moist, flavourful and slightly tangy. The meatball banh mi had some bouncy meatballs. Pretty good but I’d stick to the classic grilled lemongrass flavour. 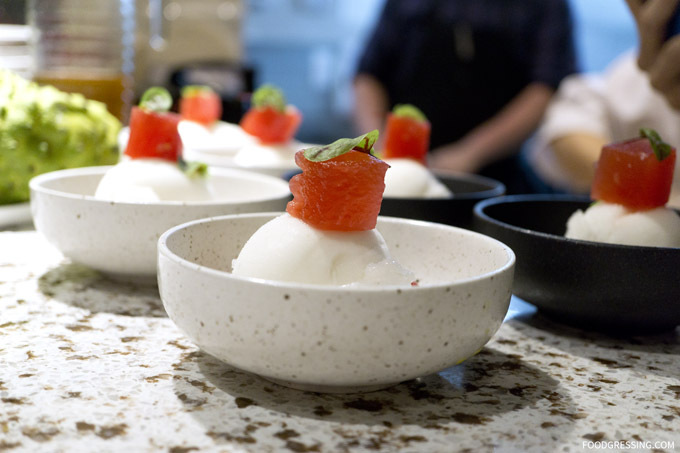 One of the more unique menu items at Baoguette are steamed buns. I had the pork belly, which was melt-in-your-mouth delicious, and the curry beef which had a nice curry flavour. 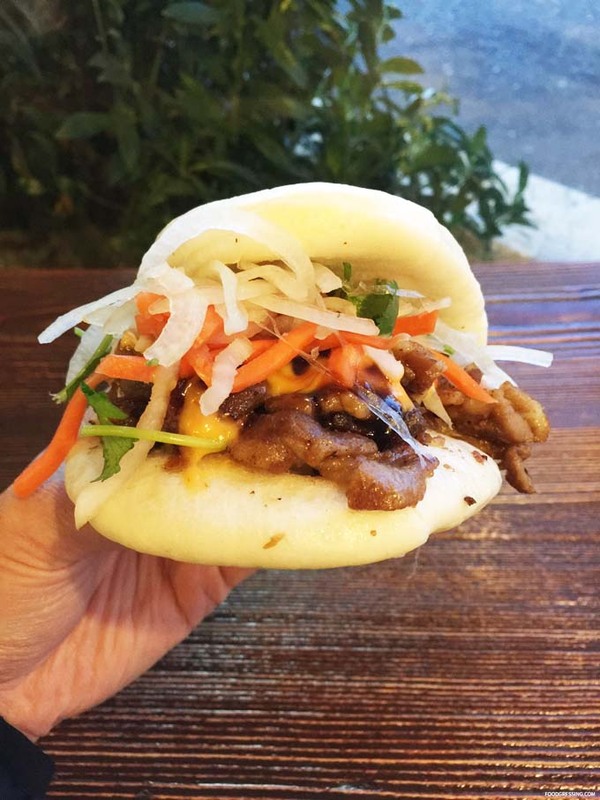 The buns were very light and fluffy and similar to those from Bao Down and Heritage Asian Eatery. 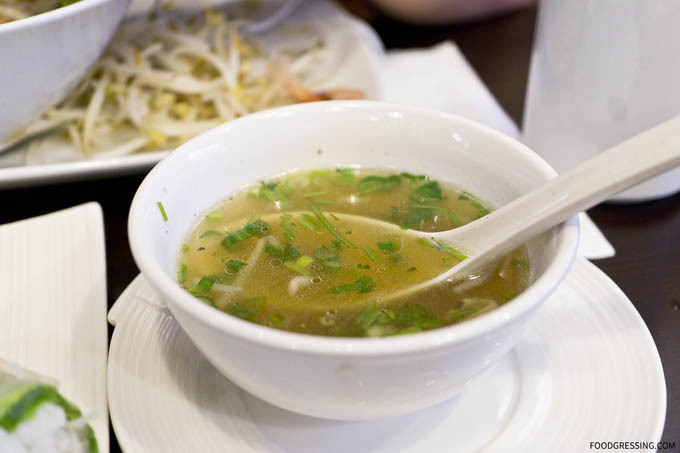 Next to ramen houses, Vietnamese pho eateries are plentiful in the West End. 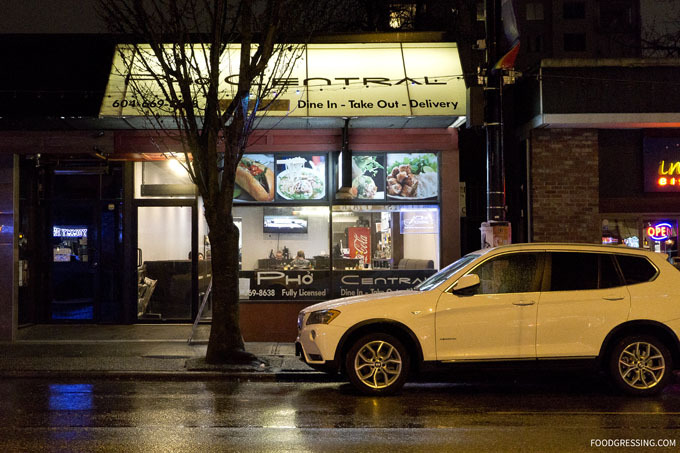 One of the popular ones is Pho Central which has been in business for over 8 years now. 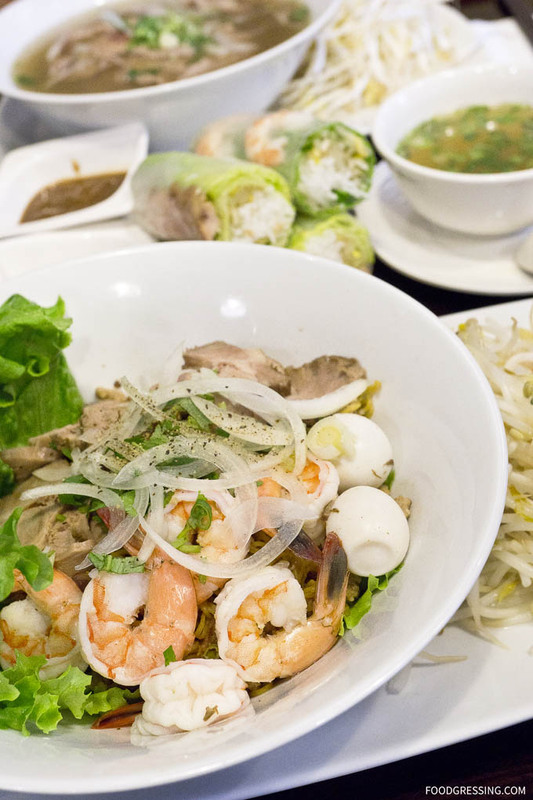 They are a casual eatery with a modern interior serving pho, vermicelli bowls and banh mi for eat-in or takeout. Prices are budget-friendly with items under $10. 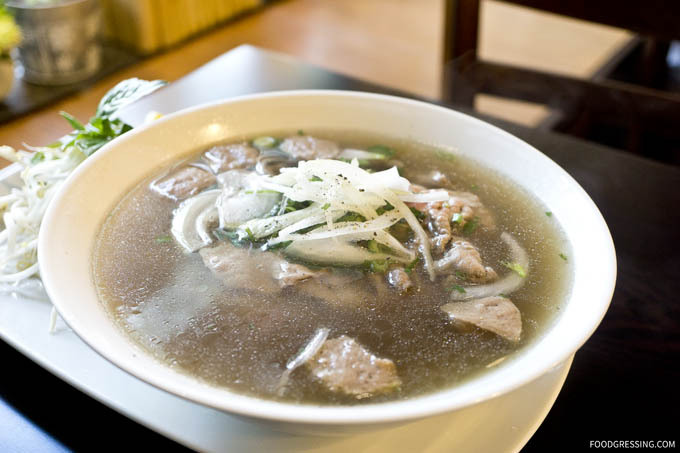 Pho Central is a departure from a typical hole-in-the-wall Vietnamese joint. The interior is modern, clean and chic with booth seating and leather banquettes. It feels more like a lounge than a Vietnamese eatery. In the middle is a bar with ambient lighting. 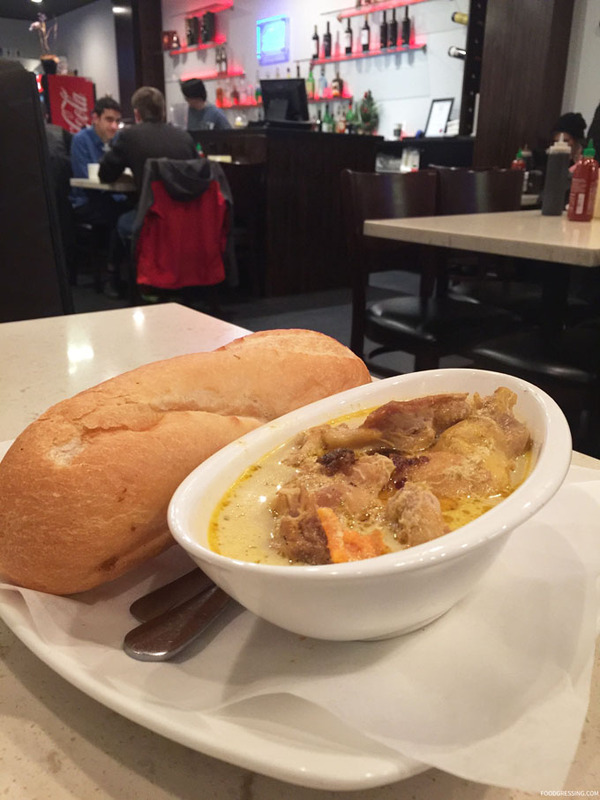 On two occasions, I went for one of my go-to Vietnamese dishes other than pho: the curry chicken with baguette on plate ($7.25). The baguette given was dense, crunchy but still light and fluffy on the inside. The chicken in the curry was wonderfully, tender and melt-in-your-mouth in decent portions too. The first time I tried their curry, I was impressed by how aromatic, flavourful with the right amount of spiciness. Because I enjoyed their curry so much, I returned for it on another visit. However, this time around it tasted more bland. I was puzzled and a bit disappointed. I guess consistency can be an issue. 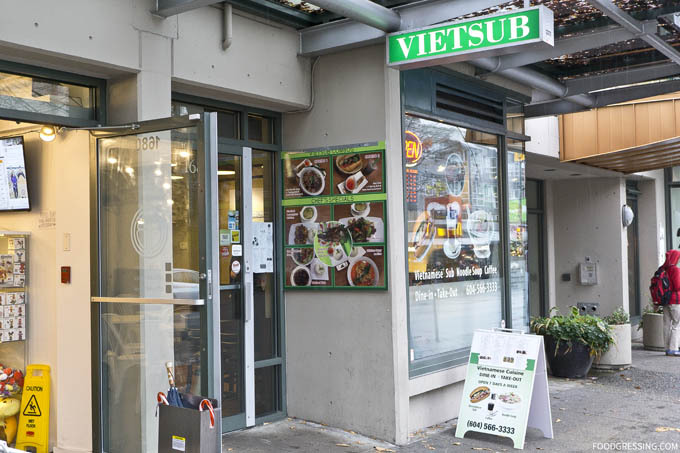 Earlier this year, Viet Sub opened their second location at 1682 Robson Street in the West End. Occupying the space formerly by Pizza Fabrika, Viet Sub is blockmates with popular eateries Santouka, Guu Garlic and the BBT Shop. 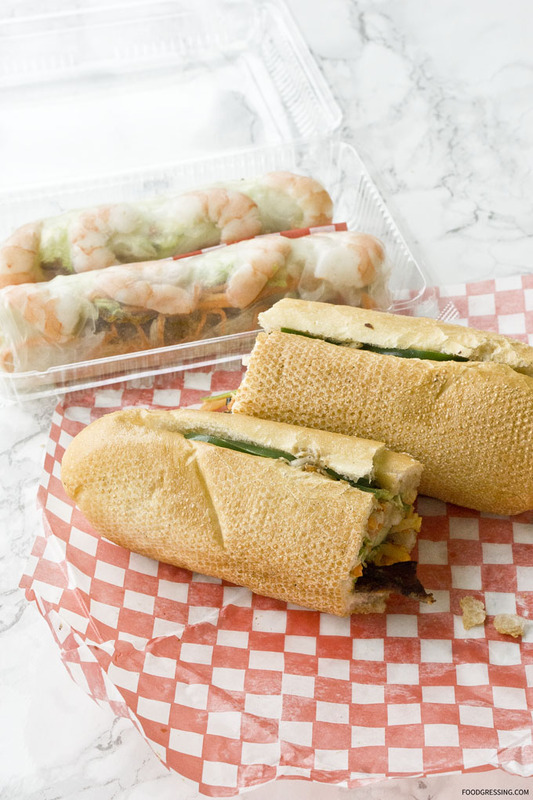 The original Viet Sub location is across the main Vancouver Public Library and is known for cheap eats including Banh Mi for under $5. While I hadn’t been to the that particular location, I was eager to try out their new one right in my neighbourhood. 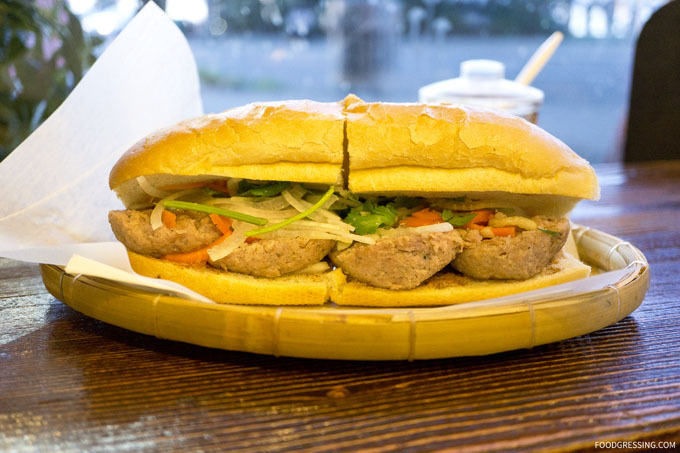 At Viet Sub, you’ll find the usual pho, banh mi sandwiches, special noodle soups, rice and vermicelli dishes. 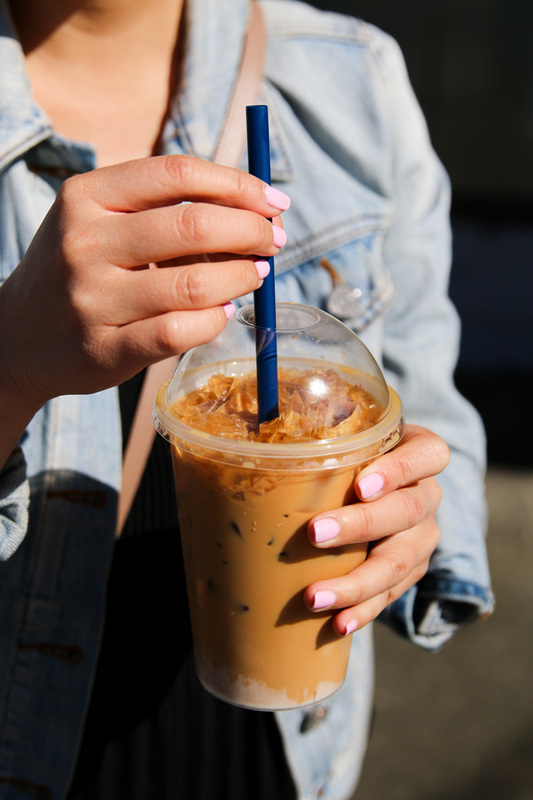 A popular drink choice is the Vietnamese coffee with condensed milk available hot or cold. Their menu is quite affordable with items generally around $10. It’s the kind of place where you can order by item number. There is no signage indicating that their food is MSG-free. Credit card is accepted. 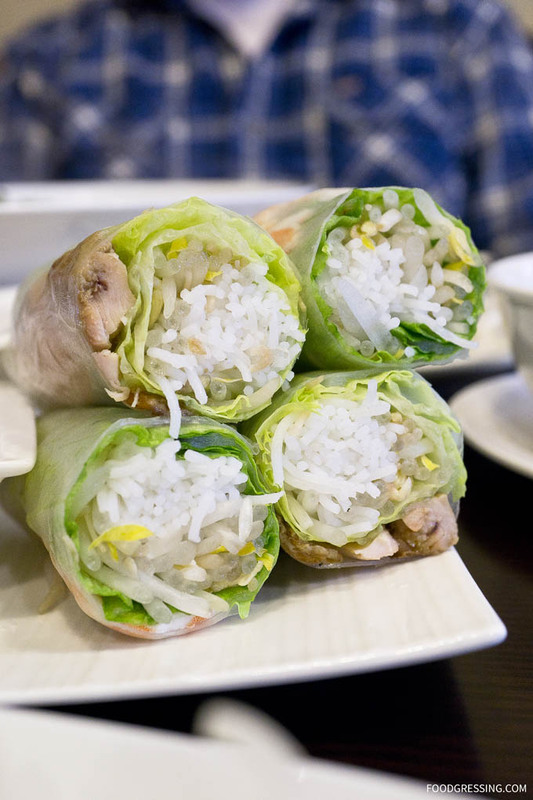 Both the shrimp and grilled lemon grass chicken salad rolls had a good crunch to them. They also had vermicelli, lettuce and a side of peanut sauce. 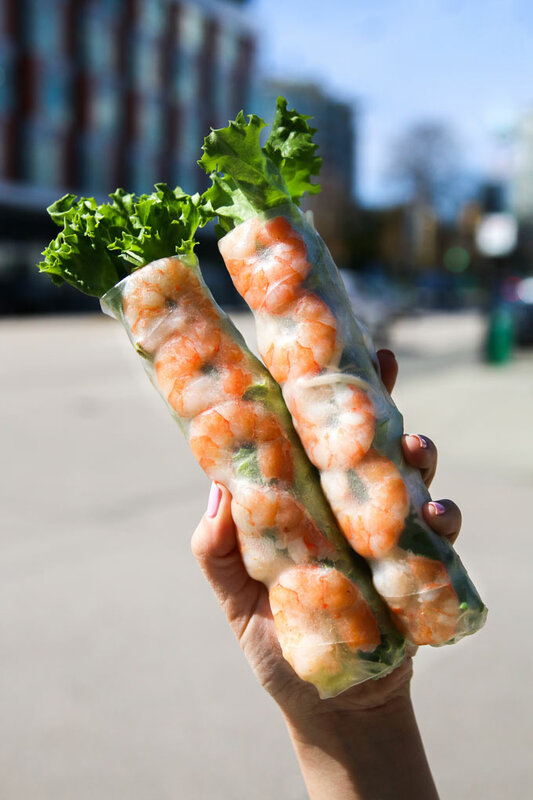 The rice paper wrapper held the ingredients tightly together. The shrimp used were decently sized and the grilled lemon grass chicken was nicely warm. 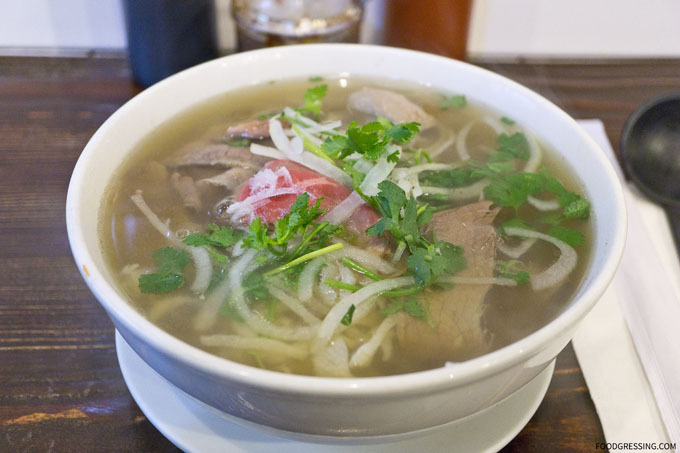 The two pho that I have tried (rare beef and rare + well-done beef) at Viet Sub were on point. 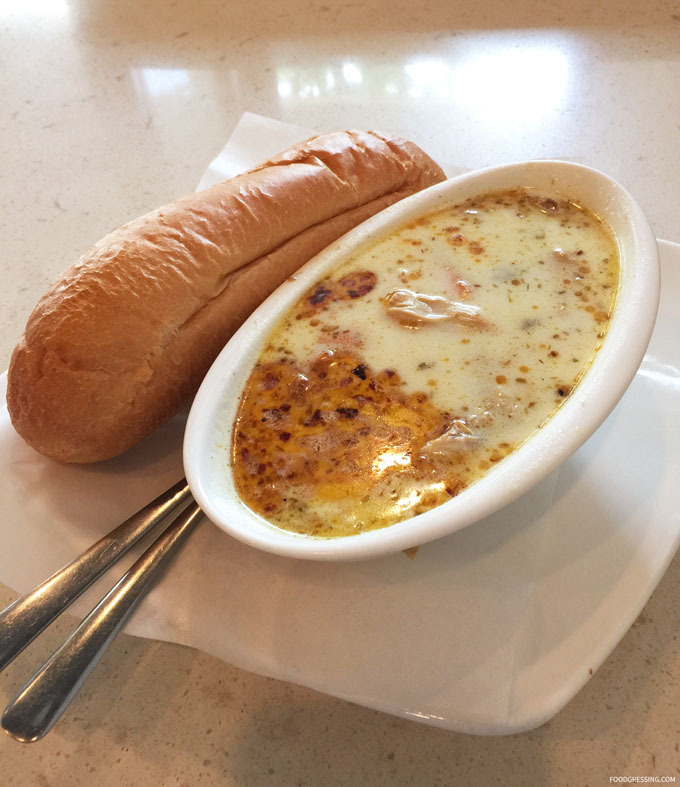 The bowls arrived steaming hot which is perfect on a cold, rainy day. 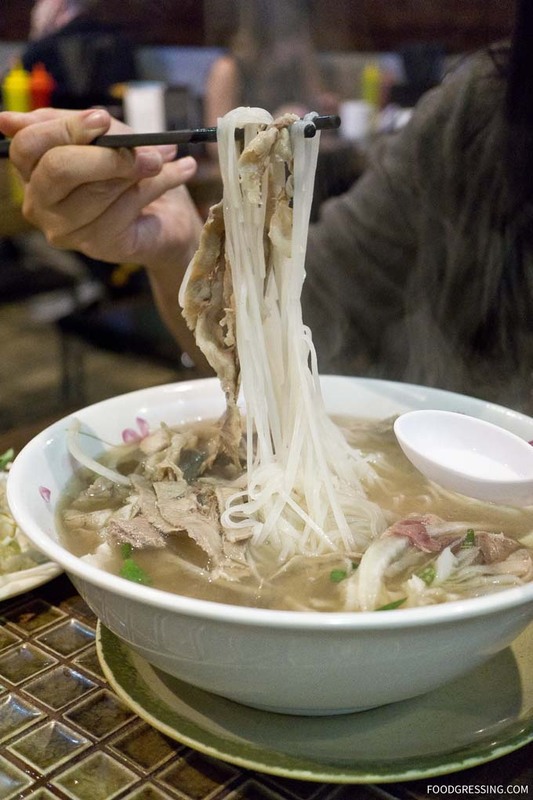 The meat to noodle ratio was very reasonable and the broth was light and flavourful. Meat was tender and thinly sliced while the noodles were slightly chewy. The special dry noodle soup came with shrimp, pork, squid and quail egg in house sauce. Good amount of ingredients for under $10. The soup on the side could either be poured into the dry noodle bowl or you can dip the noodles to the soup. I found the soup to be too salty for my liking. This past week, I attended a tea tasting at TMix Tea and Dessert Bar with noted food bloggers Maggi (vieamaggi.com) and Diana (foodology.ca). After the event, we decided to get some real food. And since it was rainy that evening, cheap, comforting Asian food was just what we needed. 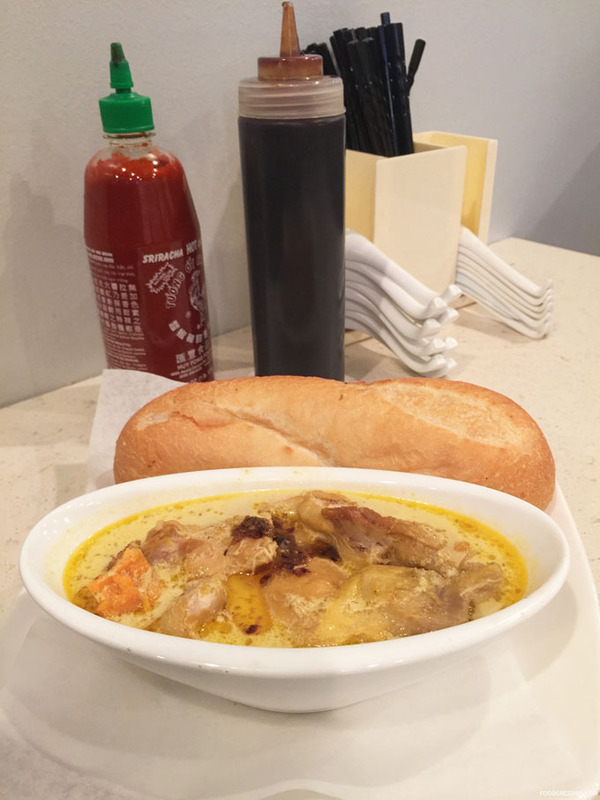 Pulling up our Zomato app, we found nearby Pho Xe Lua 24 with a decent 3.6/5 rating. We headed on down to this cash-only restaurant which was just about a block down from TMix. 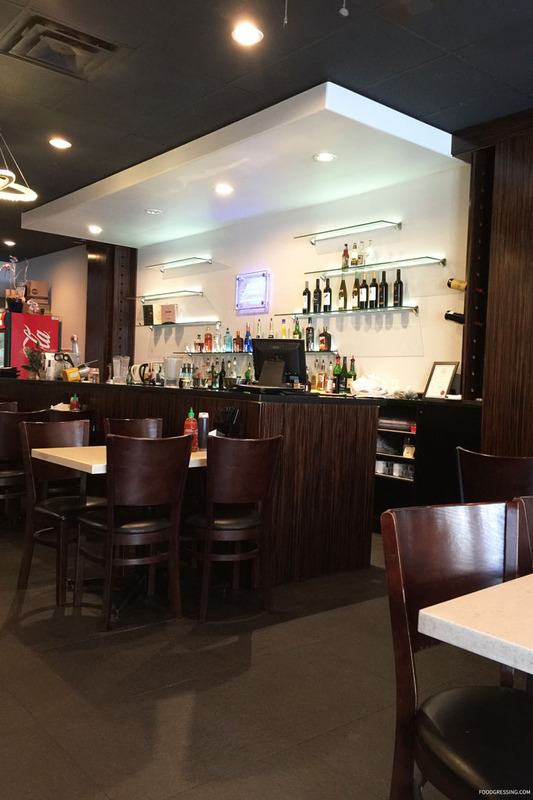 Pho Xe Lua 24 is a small restaurant with just a few dining tables. I did find our table to be a bit sticky. It didn’t seem surprising to me for this kind of place. 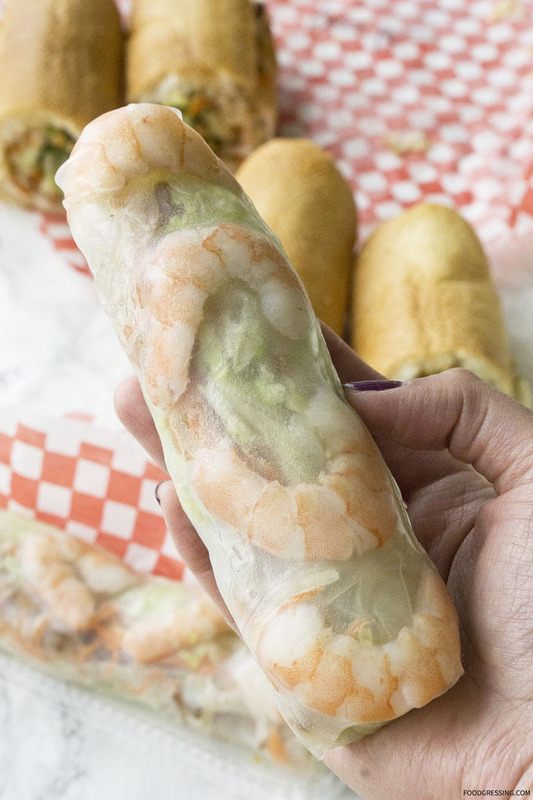 The shrimp salad rolls were a light, refreshing start to the meal. When I bit into the roll, it had a very nice crunch to it. The rice paper wrapper held the salad nicely together. 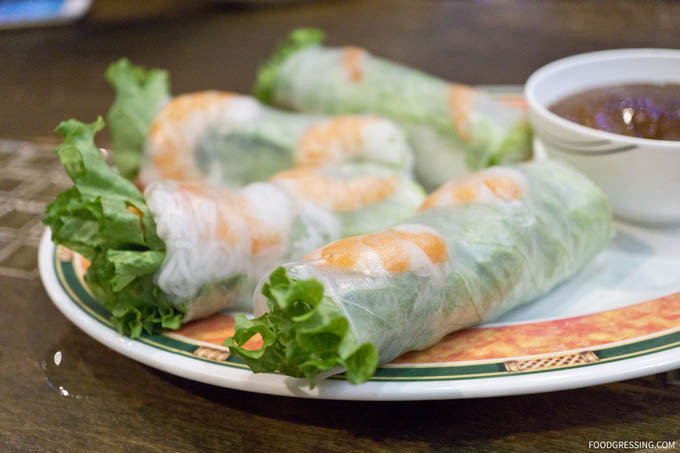 Dipped in their peanut sauce, these salad rolls were delicious. 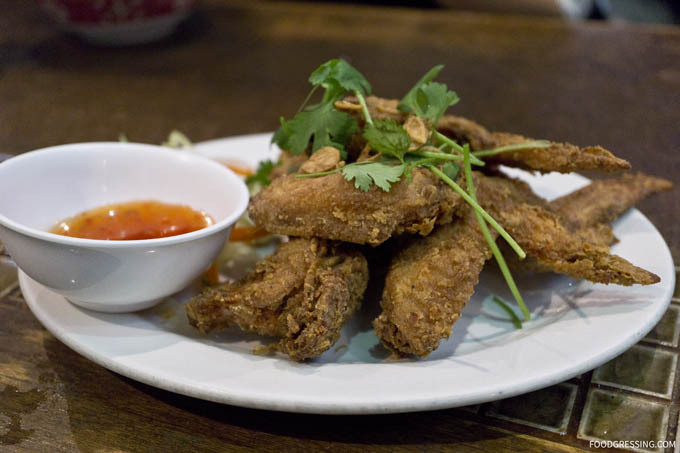 Our next appetizer, deep-fried butter chicken wings, didn’t disappoint either. They were piping hot, crispy on the outside, not overly greasy and the meat fell off the bone nicely. The plum sauce added a tangy, spicy and sweet flavour to the wings but it wasn’t necessary; the wings were tasty on their own. At Pho Xe Lua 24, the phở comes in small ($8.75), large ($9.75) and extra large ($10.75). The three of us shared the extra large House Special with rice noodles. The bowl arrived at our table steaming hot. The meat to noodle ratio was very reasonable and the broth was light and flavourful. Meat was tender and thinly sliced while the noodles were slightly chewy. 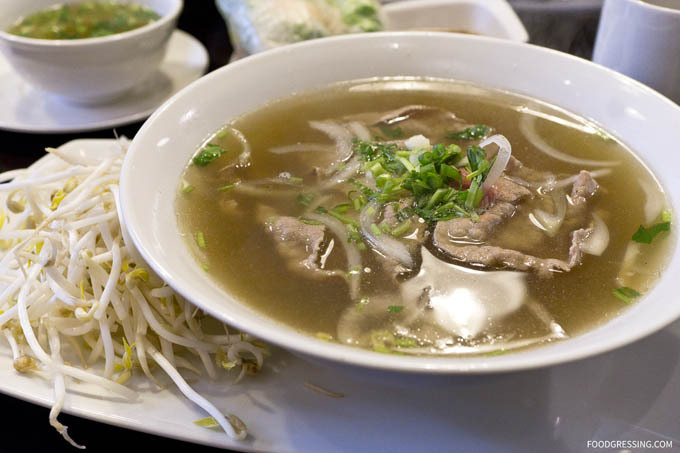 Pho-bulous, my friends, pho-bulous. The lemongrass chicken with spring roll and vermicelli was decently sized for $10.50. Flavour-wise, it wasn’t bad at all. The chicken was tasty and the spring roll had a gentle spicy kick. I liked how they didn’t give you “standard” spring roll. Really good portions of chicken too. 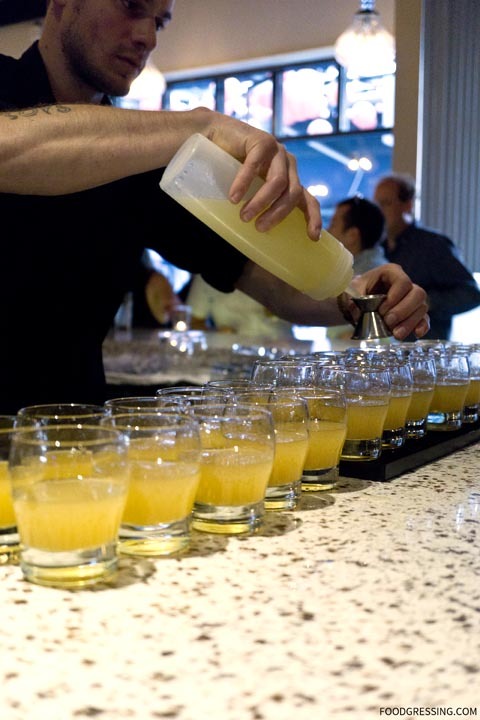 Disclosure: I was invited to a media event where all food and beverages were complimentary. All opinions are my own. 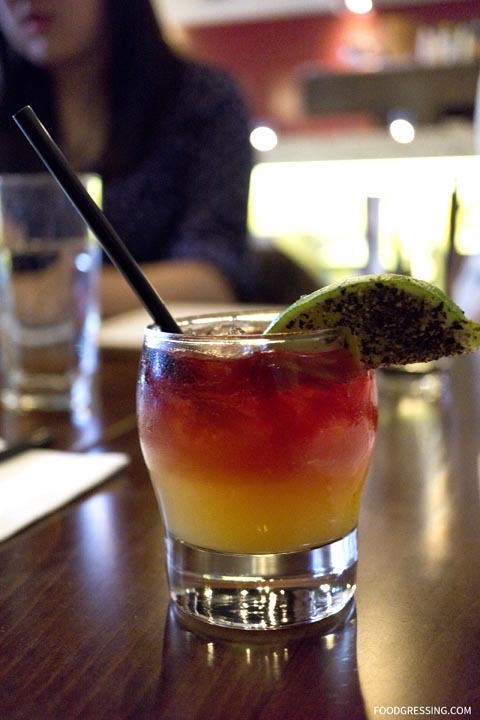 Newly opened House Special brings elevated and modern Vietnamese cuisine to Yaletown. 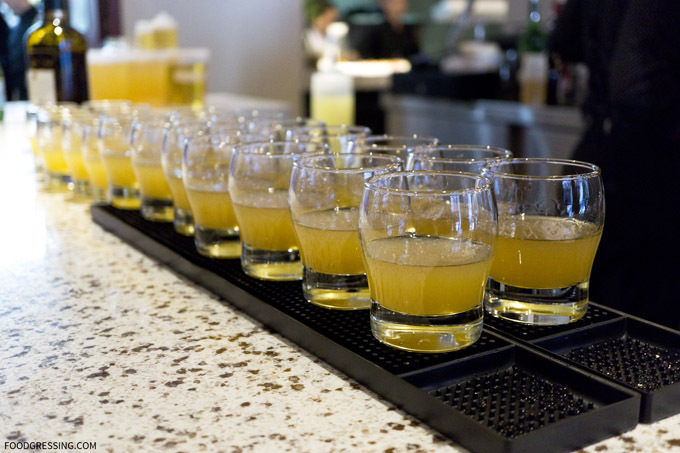 At House Special, you’ll find creative craft beer, wine and cocktail pairings with dishes that have a contemporary take on traditional Vietnamese cuisine. 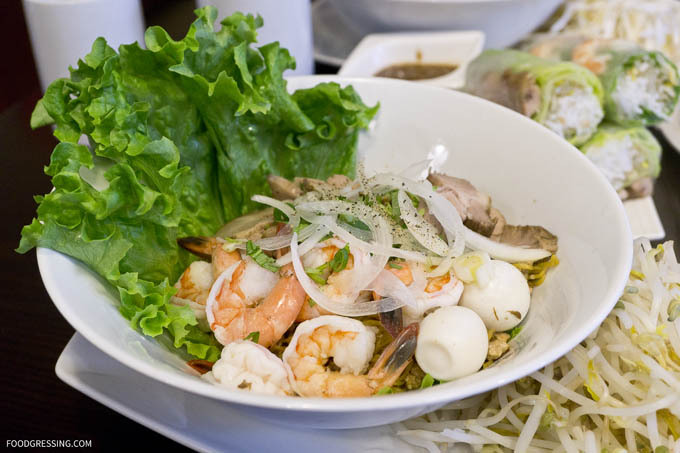 It’s a trendy eatery offering an upscale Vietnamese food experience. 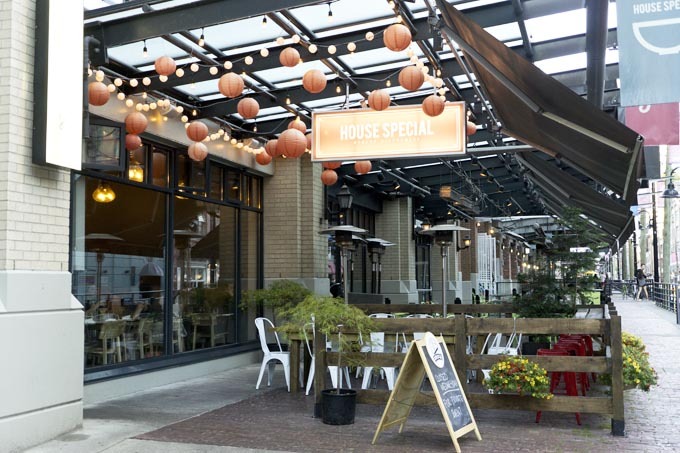 Their location (1269 Hamilton) is in a very quiet part of Yaletown but this may soon change with more traffic from foodies coming to the restaurant. 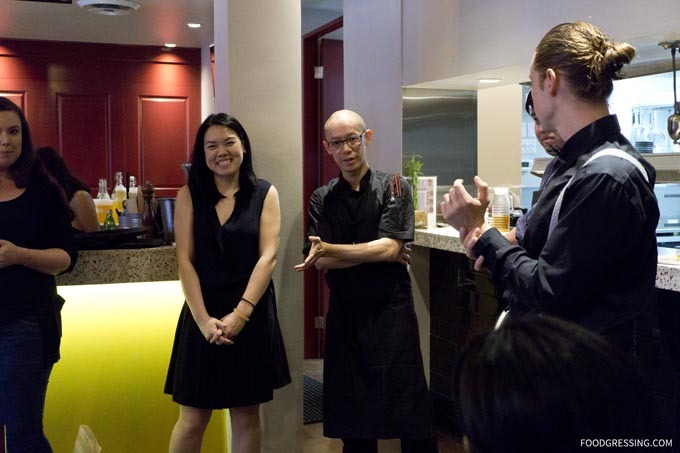 Family is at the heart of House Special as the team behind it includes brother and sister duo, Patrick and Victoria Do, along with their mother and Head Chef, Yen, working alongside Executive Chef Phong Vo (formerly Heirloom, Electric Owl, and Ramen Sanpachi). 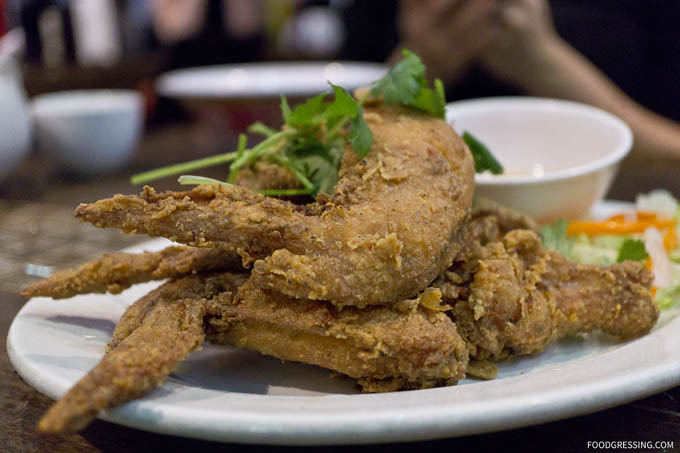 The Do family have been in the local restaurant industry for the past 30 years, operating Green Lemongrass on Kingsway and in Richmond, as well as Broken Rice in Burnaby Heights. This is the first restaurant venture by Patrick and Victoria. 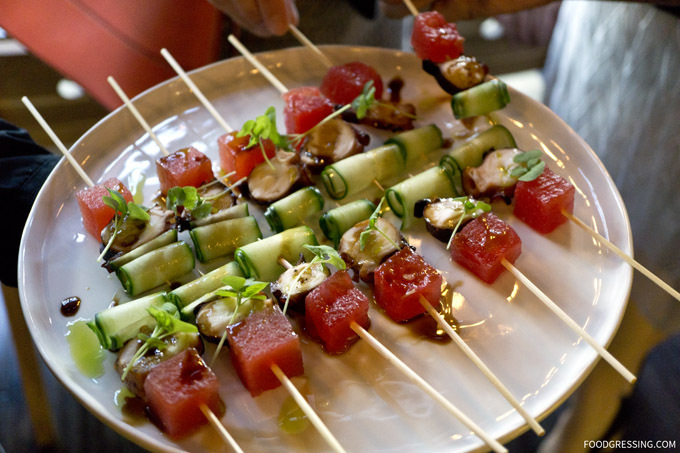 We started off the evening with a unique and refreshing appetizer: compressed watermelon, octopus and cucumber on a skewer. 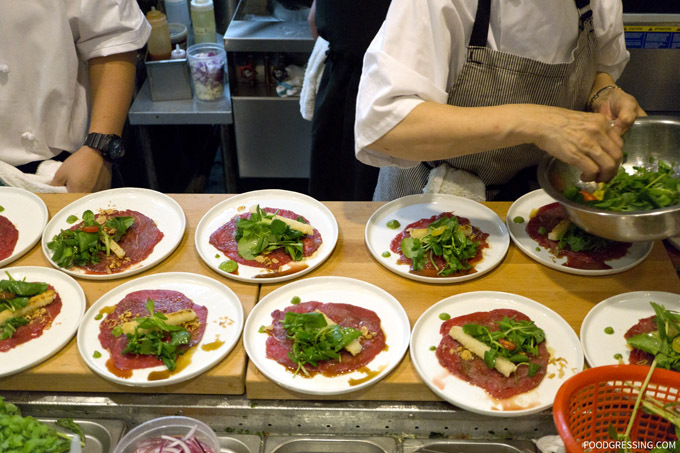 Next was the first course featuring beef carpaccio with broccoli and Vietnamese herb puree, served with crispy rice and roasted broccoli. 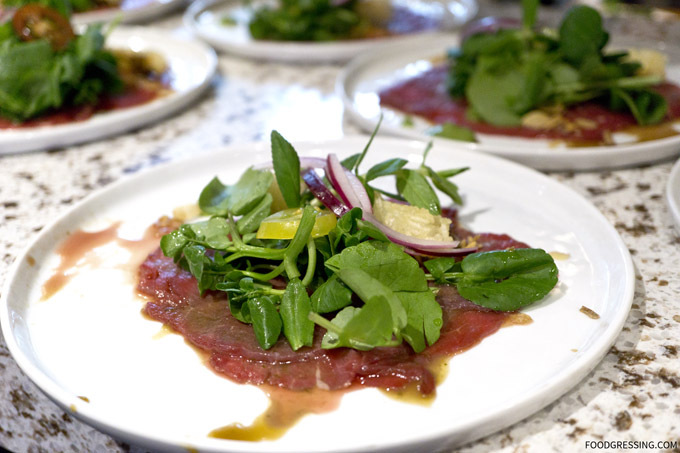 The carpaccio were nicely thin and had a slightly tangy taste. I enjoyed the crispy rice for textural contrast. 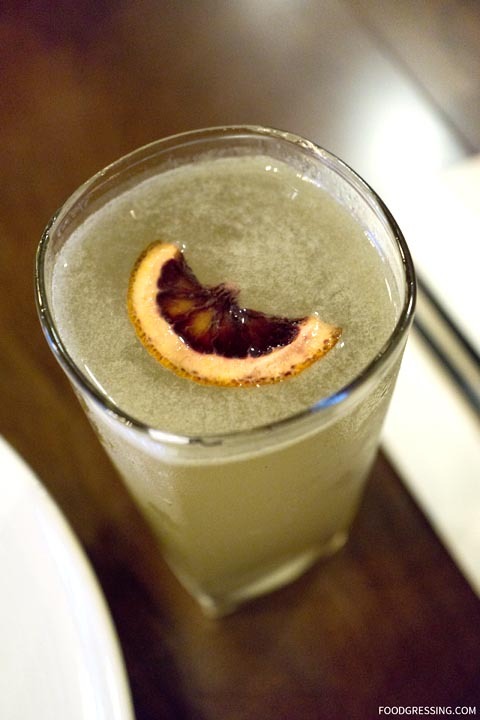 The New York Sour was a strong cocktail that was sweet and sour. 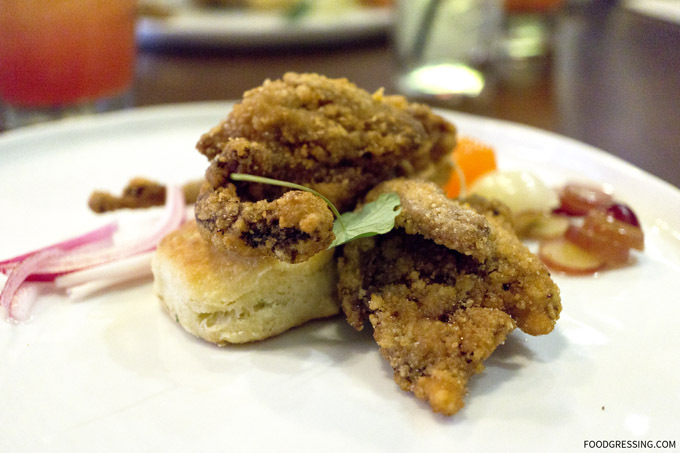 For the second course, we had chicken fried buttermilk quail and sriracha gelée, served with a cilantro and jalapeño buttermilk biscuit. The sriracha gelée should just be lightly applied to the quail for a gentle kick and some sweetness. I enjoyed how crispy the quail was. 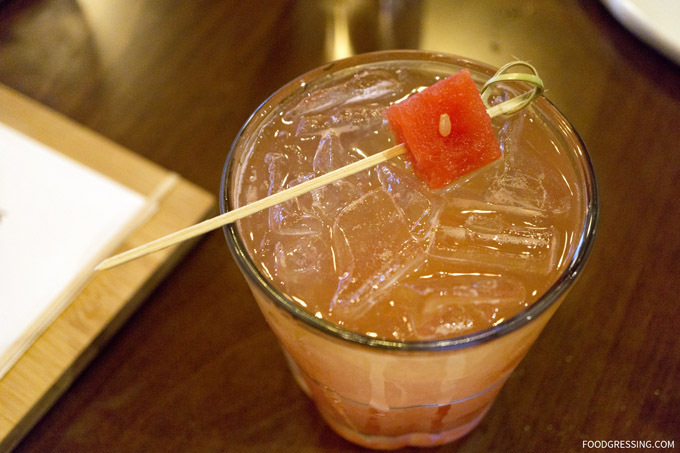 The cocktail for the second course was “Hoi An Fruit Stand” – a refreshing concoction of watermelon, gin, ginger syrup and Berliner Weisse. 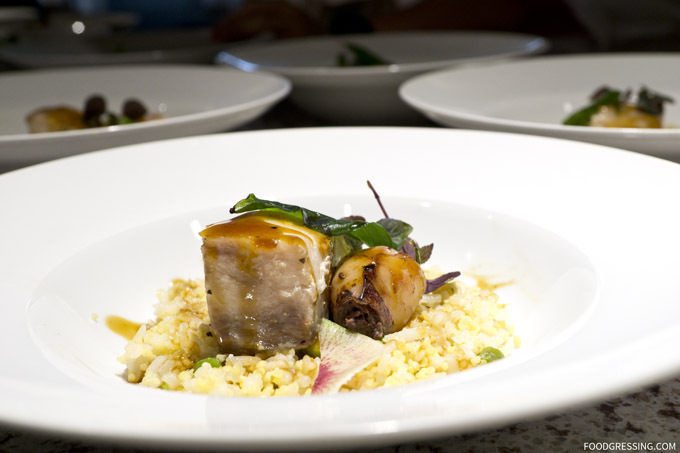 The third course seemed French-inspired: boudin noir stuffed squid with seared cobia. This dish showcases the culintary team’s creativity being filling the black sausage into the white pockets of the squid. It’s an interesting use of boudin noir, which was creamy and flavourful. The seared cobia was moist and tender. The Sake Iced Tea was wonderfully aromatic and refreshing. It’s such a deceiving cocktail in being able to hide the alcohol taste so well. My favourite drink of the evening. 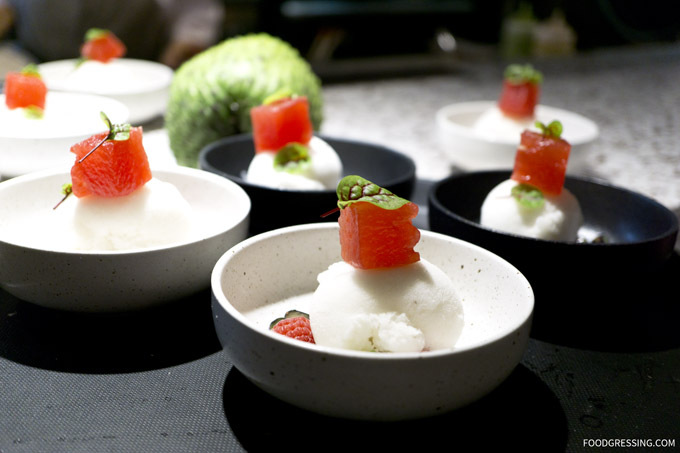 To finish off a fantastic meal was the fresh soursop sorbet. I must admit that I wasn’t familiar with what a soursop was. 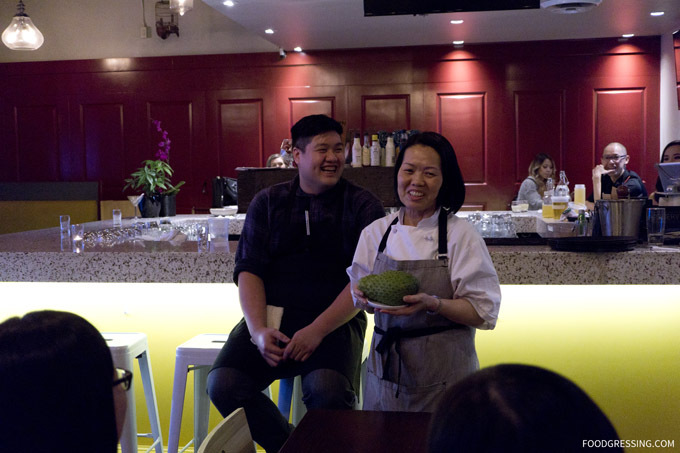 Fortunately, Patrick and Victoria’s mother/Head Chef, Yen, brought out the green tropical fruit to show us. 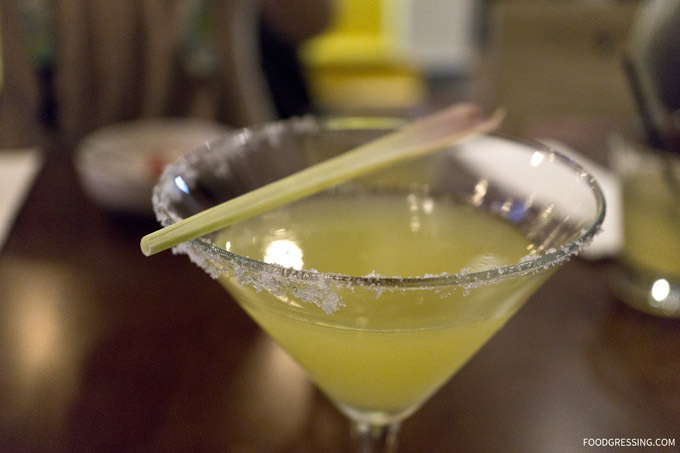 The final cocktail of the evening was the Lemongrass Drop: citrusy and vodka-infused. 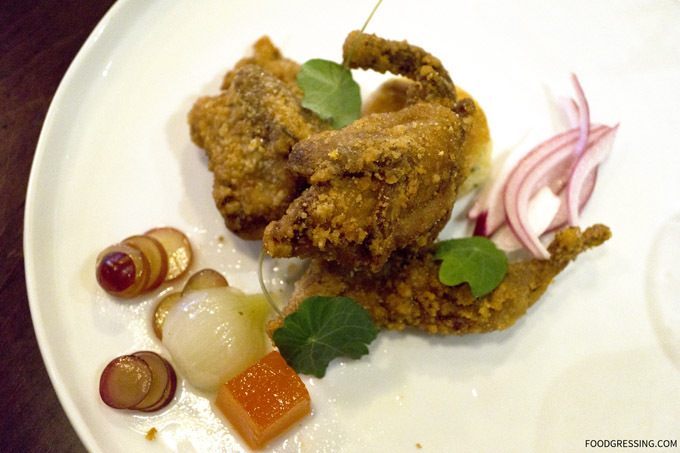 All in all, I was impressed by House Special’s innovative take on Vietnamese cuisine. 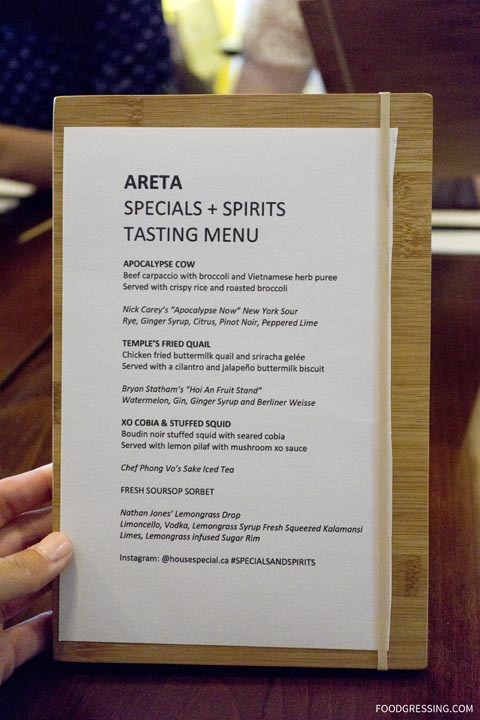 It was a first for me to experience a cocktail pairing with Vietnamese dishes. 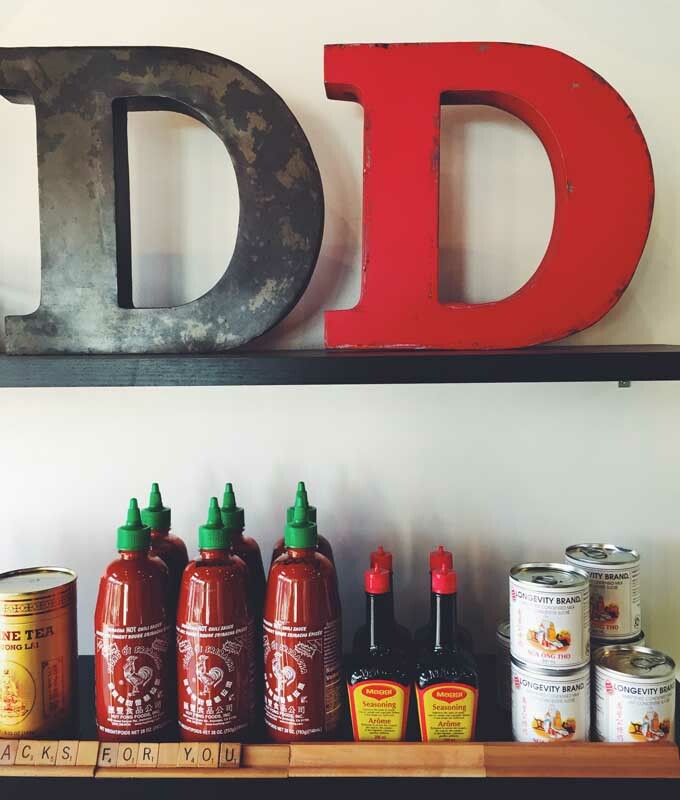 DD Mau is one of my go-to places in Yaletown for a light lunch or snack. 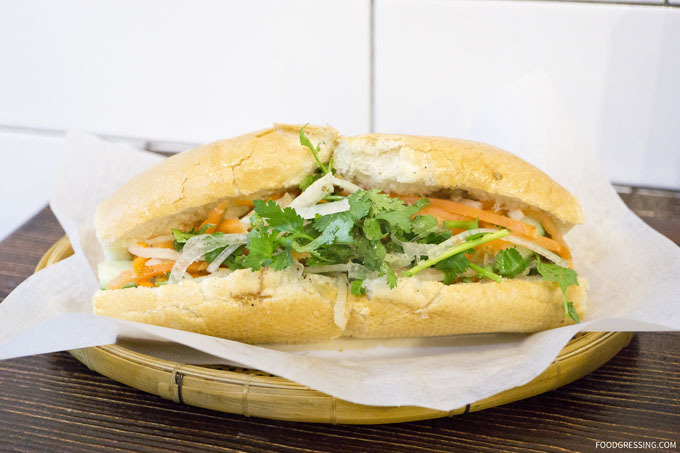 They offer delicious Vietnamese sandwiches, otherwise known as bánh mì. 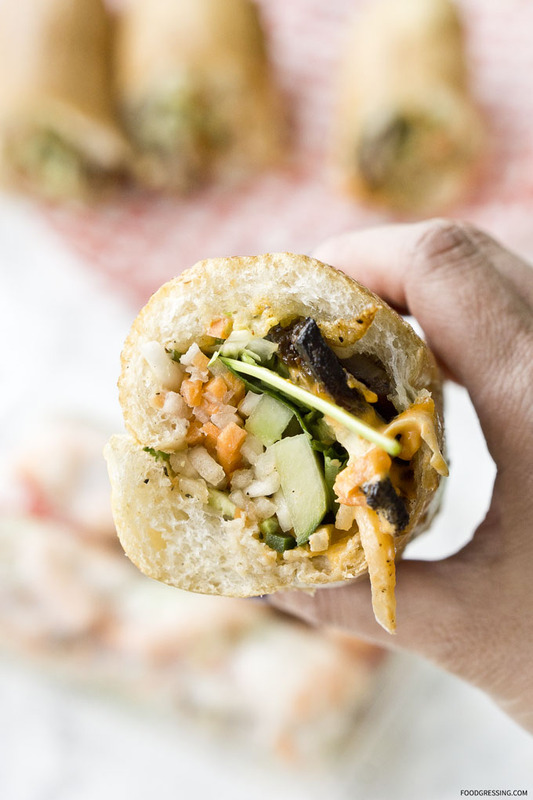 These sandwiches are served on a fresh baked baguette with cucumbers, pickled radish, carrots, cilantro and jalapeños. This post reflects my experiences at DD Mau on several occasions. 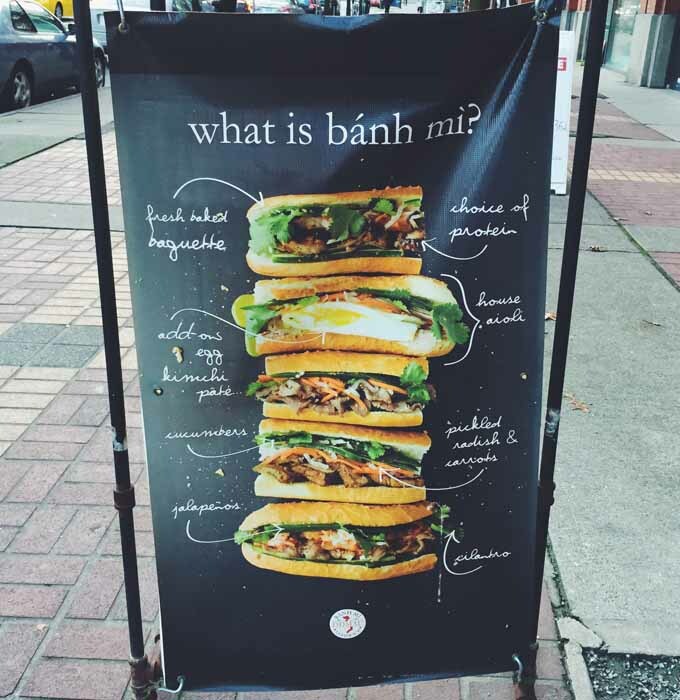 The Wikipedia entry shows that Bánh means bread and mi means wheat. 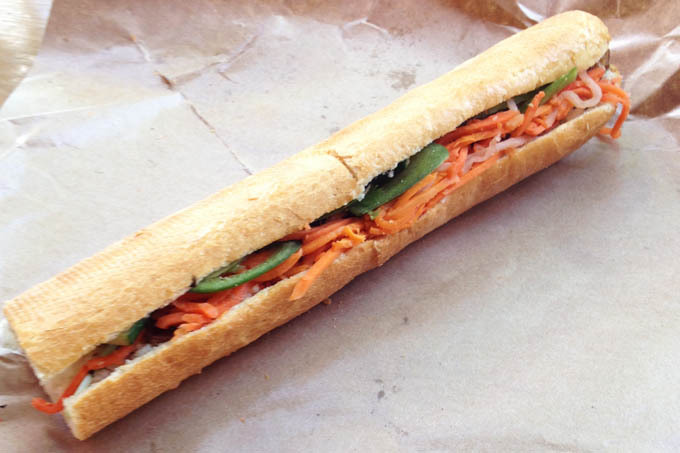 It is a product of French colonialism and combines ingredients from the French (such as baguette, pâté and mayonnaise) with Vietnamese ingredients. The sandwiches cost $7.50 for the full and $4 for the half. I would recommend the full order even as a snack as it is not very big. I would consider the prices to be fair given the area. My regular sandwich order at DD Mau is the lemongrass chicken with house marinated chicken thighs and sweet-chili aioli. 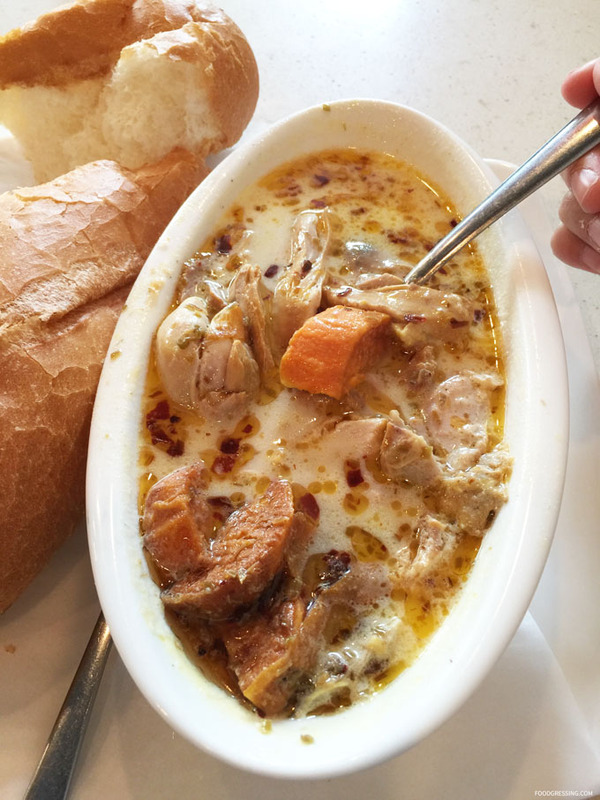 The baguette is dense and crunchy and the chicken pieces are tender. I love the sweetness of the sandwich from the aioli. I have also had vermicelli bowls with two items ($8.80). 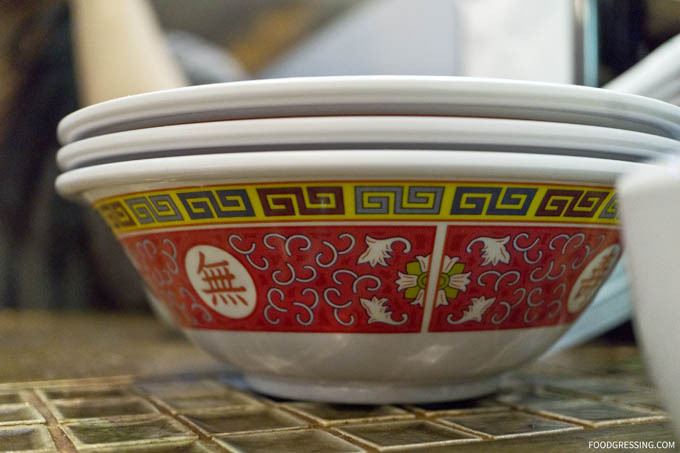 You can also order the bowl with three items for $10.80. 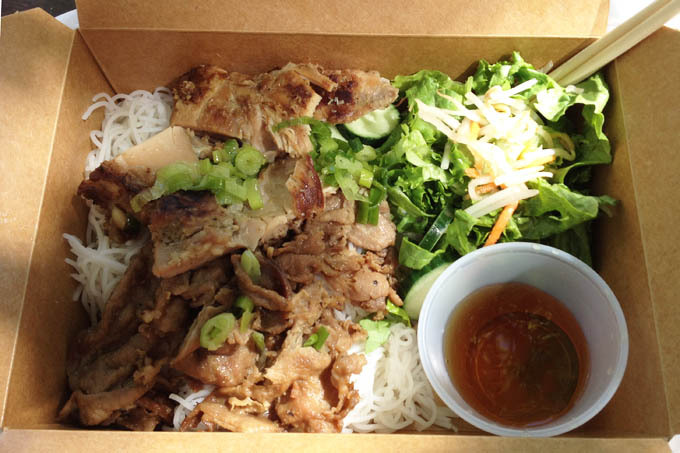 The chicken and pork vermicelli bowl was light and delicious. The proteins were sweetly marinated. 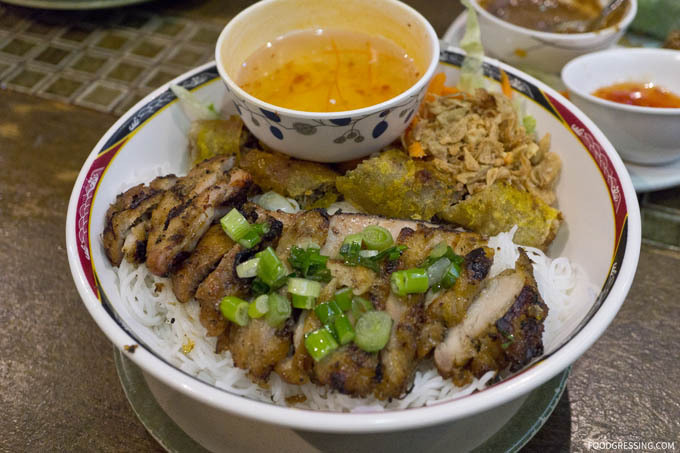 I also really enjoyed the vermicelli bowl with pork and spring rolls. Wow, I *loved* the spring rolls: light, crispy and indulging with that bit of mayo. What I like about DD Mau is that they have loyalty rewards. I use a mobile payment system called Pay With to pay for my meal. 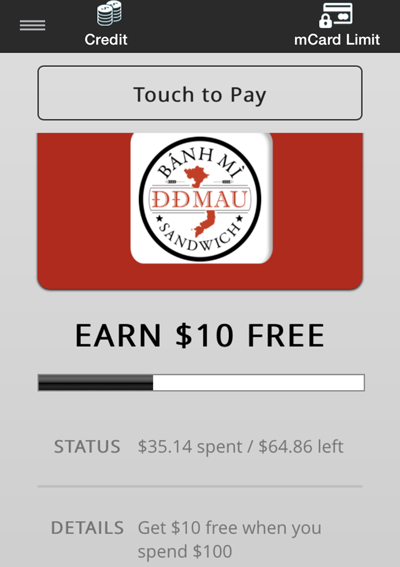 Because I use the app, I can get $10 dollars to spend at DD Mau after spending $100. DD Mau also has their own app (Apple and Android) but I have not used it. I heard that it is a great way to avoid the line-ups. 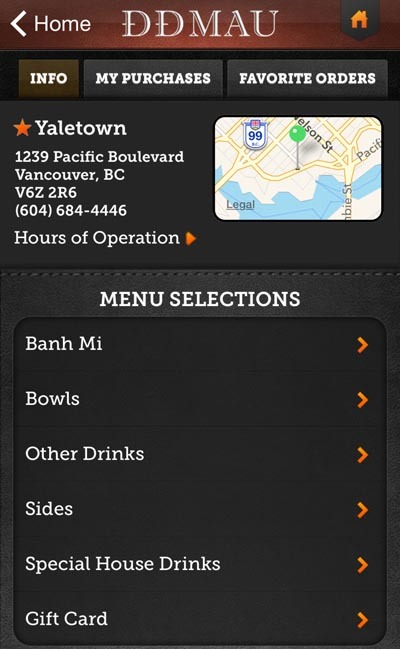 For some tasty and light sandwiches or rice noodle bowls in Yaletown, I would recommend DD Mau. I will be sure to keep collecting loyalty points as I keep dining there!